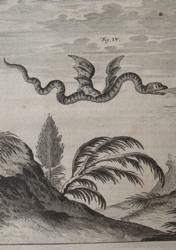 Original copper engraving (not a modern reproduction) produced in 1723 for Johann Jacob Scheuchzer's exceptionally rare book, Ouresiphoites Helveticus; sive, Itinera per Helvetiae alpinas regiones. 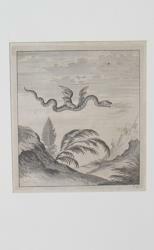 The dragon images from Scheuchzer's book are renowned among mountain historians and are featured in nearly every serious history book of mountaineering. This is an original plate from the book. It came from a collection that lacked the book but had two plates from it. The plate has been compared with one still bound in an original 1723 example of the book and clearly passes as being original: 1) the thin, ribbed paper is an exact match; 2) the ink strike is an exact match; 3) the size is an exact match. These plates are nearly never offered for sale individually, being almost 300 years old, and being from a book that itself is quite rare. We have not encountered any Scheuchzer plates of dragons offered for sale (except now) in over 40 years of working with this type of material. The plate image area is 180mm tall x 162mm. 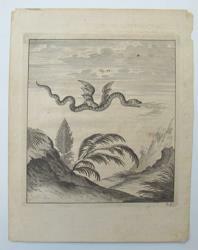 The the original 1723 paper on which the image is printed measures 244mm tall x 190mm, preserving nice wide margins. The matting for the image is rather amateurish and should be replaced with archival quality matting and backing. 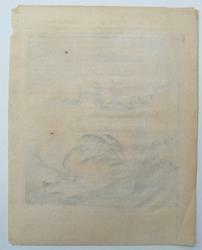 CONDITION: The image is strong with no fading of the ink. The paper has some small, ancient bug holes mainly in the upper right section, with very little interference to the main image. The paper is stable and sound, not brittle or decayed. It will last another 300 years if not exposed to harsh environmental conditions like strong UV light or moisture. Price: $150.